Tables and chairs are arranged under light-filled windows. Sparse decoration cuts down on clutter, and the quiet hum of busy activity puts your mind into work-mode. 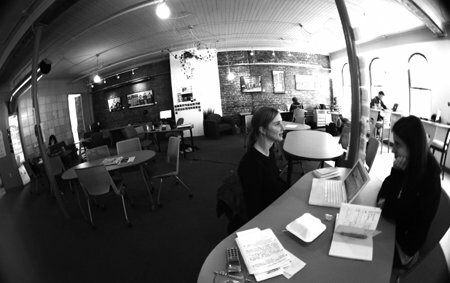 The Hub on Barrington Street is a place for people to really “get stuff done”, as the website says. Joanne Macrae, host of the day and one of four co-founders of The Hub, greets me with a warm smile as we sit down to discuss the way the place got started and how it functions. Macrae and the other co-founders literally started it with their bare hands. They did a lot of the handiwork and renovations themselves. They each put money into the project. They figured The Hub was a good idea and decided to “just go for it”. The Hub, which opened in February, functions as a workspace and meeting place for anyone who wants an office downtown without signing a lease or paying a fortune. “The people that work out of the Hub is a real cross-section,” Macrae says. “Small non-profits, people who have been in business for 10-plus years, and small business” owners all share the space. A political science and philosophy graduate from Dalhousie, Macrae loved Halifax and wanted a space that could capture the talent of the community and young people starting businesses and organizations. The Hub is more than just a meeting space, it is also a “green” space. The insulation is made from blue jeans. A projector screen is a repurposed old sail. The chairs and carpet were locally bought and made of 98 per cent recycled material. Even the nails and wood are second-hand. They sacrificed time and money to ensure that the space would set a good environmental example. Members pay a monthly rate and get 30 hours, 50 hours or unlimited access to the space during weekdays. They can also book events after 6 p.m., or on weekdays. Group access for up to 10 people costs $399 per month for 150 hours. Macrae says The Hub isn’t about making money; it’s about connecting people. Anthony Myers goes to the Hub to do some of his Internet business consultant work. Basically, he makes money online, and for 10 to 12 hours a week, he does so at the Hub instead of at home. Why? Myers heard about the Hub months before it opened. He joined as a member two months ago, and now is a volunteer host. He shows new people the possibilities of the place. It isn’t just a place to do work, he says. He’s attended concerts in The Hub, and in June, had one of the most moving experiences of his life at a roundtable discussion on racism there. “You wont find anyone with a bad word about the Hub,” Myers said.